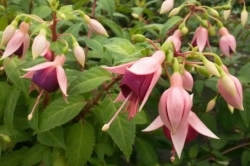 a - No plants will be dispatched during frosty conditions. If this happens we shall not inform each customer separately. b - Occasionally we may have to hold part or all of an order back to ensure that the plants are sufficiently rooted to withstand the rigours of the post. If this happens we will keep you informed. We always endeavour to meet orders as placed, however, occasionally there may be shortages of some varieties. In the unlikely event of this occurring we reserve the right to substitute another variety of similar type, unless you clearly state this to be unacceptable, in which case a refund will be sent with your order.